French teachers on itinerant assignments often feel somewhat isolated and disconnected from colleagues. Many times, they may be the only teacher with that assignment at a school and will have no colleagues to network with. They also sense that some students and their parents don’t value French instruction. It’s no wonder that occasional teachers list core French and French immersion assignments as ranking high on the anxiety scale – even when they have FSL/FI additional qualifications. 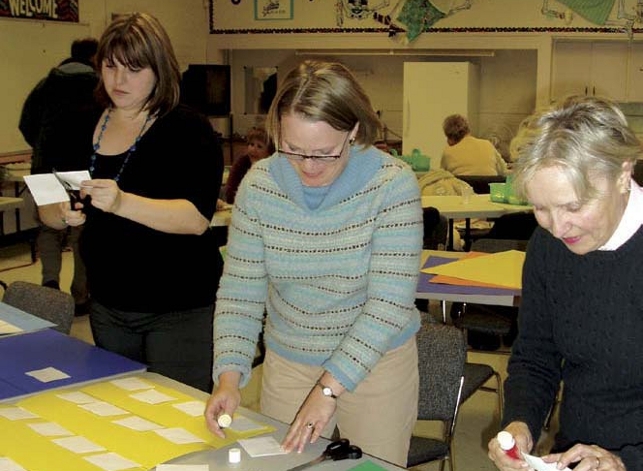 The recognition that this segment of our membership has speciﬁc professional development needs recently prompted the Hamilton-Wentworth Occasional Teacher Local to access ETFO FSL incentive funding. We formed a steering committee that included the board coordinator for FSL/FI, ETFO executive staff, and the local. The committee brainstormed numerous initiatives and ideas for FSL/FI, but felt the best starting point was to ask the occasional teachers themselves for input. Integral to the success of all events was our commitment to draw on the strengths and experience of the members themselves by inviting them to share their best practices with col- leagues. The Bonne Année French Café event occurred early in January. All OTs, including those with FSL/FI qualiﬁcations, received individual invitations to the event. The gathering featured a light supper, a social mixer en français, and a guided activity whose purpose was to draw out the PD needs of OTs who are willing to teach French. Each participant received a gift package of FSL/FI materials. The committee identiﬁed several areas where members wanted support. In response to member needs, we organized a marché. Suppliers brought their wares, experienced OTs shared their best units and resources, and snacks were provided, all in storefront style. The ﬁnal event for this school year was a Make ‘n’ Take called Jeux français. Members were invited to participate in developing practical games and activities for use across all grades (with no cost for materials). A pizza supper was provided. The committee has received extremely positive feedback from members. Some comments from participants included “Finally, somebody’s doing something for us,” “Mille mercis,” and “I didn’t know who to ask for help and here you are!” One member even pleaded her case with her administrator to allow her to attend the afternoon marché! In October the marché will be included in the local’s “Get Stuff!” storefront event for new teachers and will feature the use of technology in enhancing FSL/FI instruc- tion. As well, the committee will offer the French version of Mind Games. There is also talk of a mentorship program. The committee members are Rian McLaughlin, Tammy Clark, and Gisele Portelance, assisted by ETFO executive staff member Jennifer Mitchell.